"Are you discontented with the part you have been assigned in the whole? Recall the alternatives: Providence or atoms, and how many are the demonstrations, that the cosmos is a city." Roman Emperor Marcus Aurelius as quoted here. 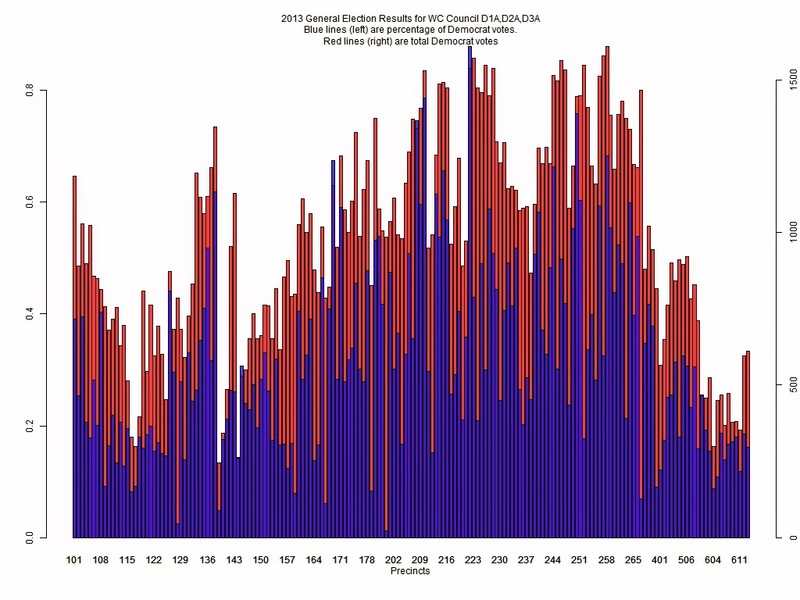 The 2013 General Election: The Democrat/Republican divide as seen from the cumulative precinct returns for County Council 1A, 2A, 3A races. This chart shows the classic BLUE/RED City/County split with high density Bellingham urban and near urban areas voting BLUE, while most of the county votes RED. Click to Enlarge. There is no intersection between the top 30 BLUE precincts and the top 30 RED precincts in Whatcom County. The top thirty BLUE precincts are remarkably Democratic; essentially all of them ~ 75% BLUE or greater. That the Republican top 30 was not quite as strong may have well assured the Democrats their victory. This is an important point for the 2014 elections, since many of the top Republican precincts are in the 42nd. 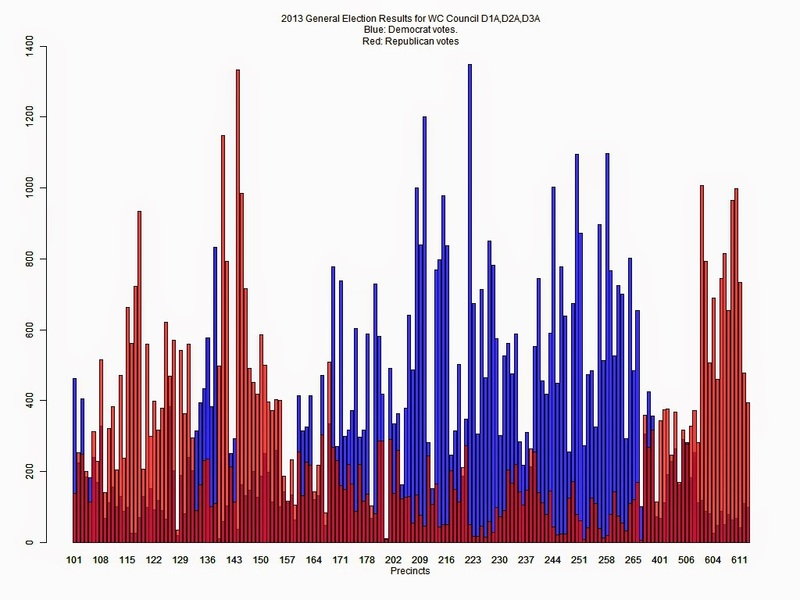 The 2013 General Election: The Democrat/Republican divide as seen from the cumulative precinct returns for County Council 1A, 2A, 3A races: top thirty precincts for each party. 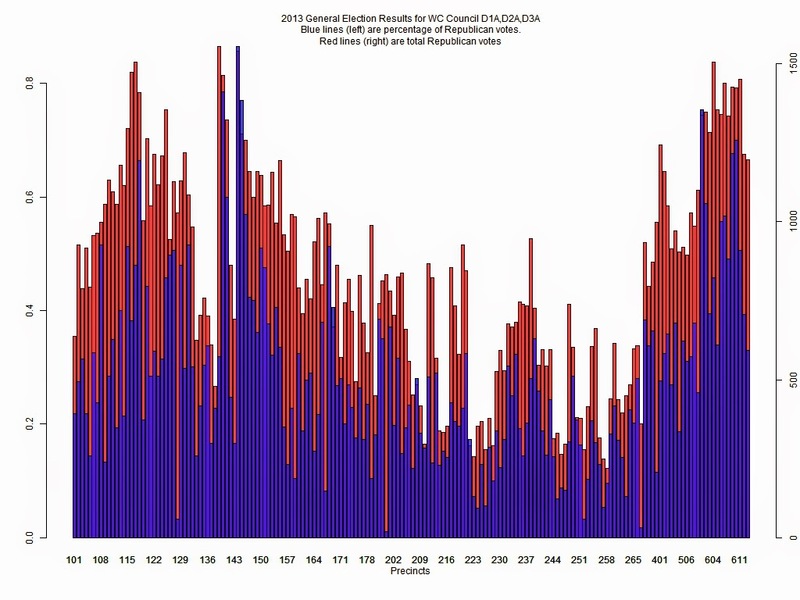 The chart below uses red/blue to demonstrate Democrat percentage (left axis) and turnout (right axis) by precinct. We can clearly see the blue turnout numbers generally rise in the Bellingham 200 series and fall in the north county; but notice that hardly all of 200 series precincts have a high (red) percentage. 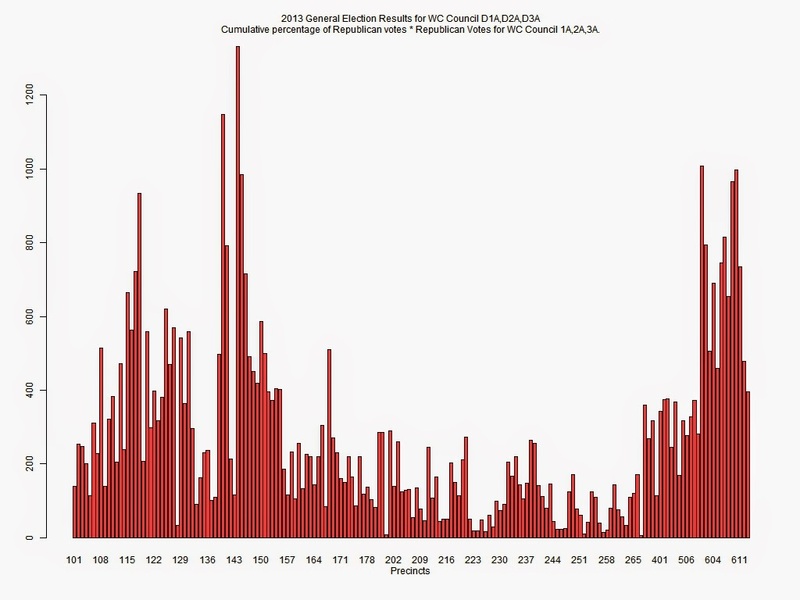 Nor is the turnout percentage for Democrats hopeless in the 300 - 800 series precincts. Even in the areas of each of the parties respective strengths, this chart still demonstrate a purple metric. The inverse chart below uses red/blue to demonstrate Republican percentage (left axis) and turnout (right axis) by precinct. The statistics below give us another look at the "purpality" of Whatcom County. 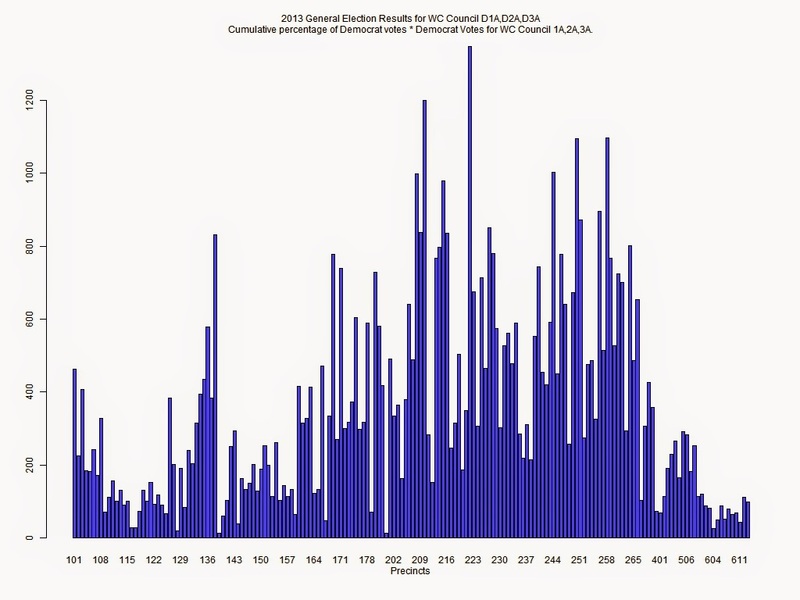 By multiplying the cumulative percentage of Democrat (or Republican) votes by the Democrat (or Republican) votes for the three council races, we get a (rate * volume) metric. 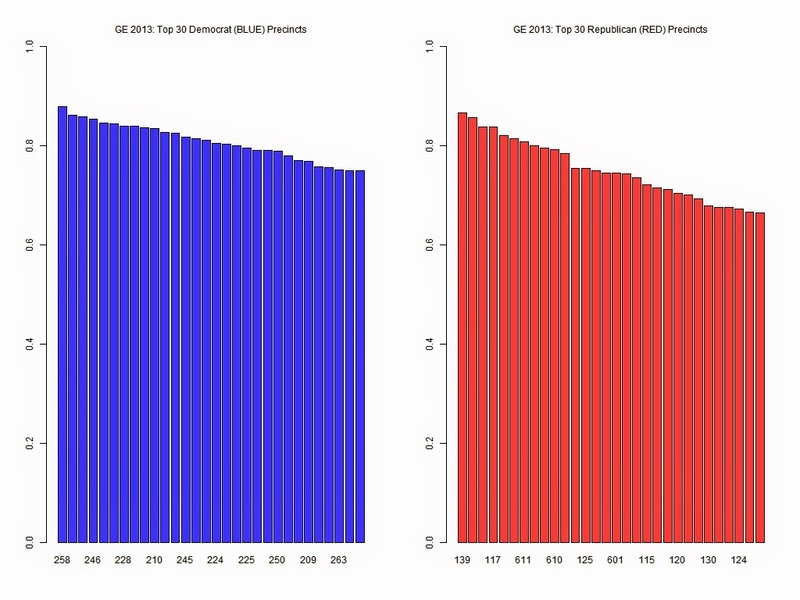 This highlights a little more markedly Democrat vs. Republican strong precincts. But still, a deep "purpality" runs through the county as a whole. On Friday, an eighteen day voting period for the WA primary begins. Be you red, blue or purple, please vote. Code for this post is here. Using accumulated County Council 1A, 2A, 3A races as a determinant of the BLUE/RED divide was somewhat arbitrary. The races were county wide, however each candidate originated from the specified districts.